Politicians need to be clear: do they take climate change seriously or not? You do not even have to accept the most severe predictions about the consequences of climate change to understand that we stand at the brink of something dire. You only need to look at the 4th National Climate Assessment, put out by 13 agencies under the Trump administration itself, which warns of “cascading impacts that threaten our economy, national security, essential services, and health and well-being.” The basic science is so settled that conservatives are coming around—even the Wall Street Journal op-ed page now barely bothers to dispute it. Everyone with any measure of political power must therefore face the same basic questions: What are they going to do about it? What plan to halt climate change do they endorse, and how are they going to make sure it happens? The institutional Democratic Party has, for too long, essentially denied climate change. Rhetorically, of course, they admit that it’s real and they’re very concerned. But they do not act like people who think it’s real and are very concerned. Even today, Barack Obama is proudly bragging that he is responsible for America becoming the world’s largest fossil fuel producer. For anyone who accepts the scientific consensus on climate change, it is deranged to think of this as something to take pride in. Even the Economist admits that if the “free market” continues to allow fossil fuel companies to go forth with their plans, the earth will be ruined. Now, thank God, there is the beginning of a plan. Alexandria Ocasio-Cortez, who is quite literally one of the four or five most useful people in the entire world right now, has introduced a Green New Deal resolution. It is extremely ambitious, calling for the achievement of net-zero greenhouse gas emissions and “meeting 100 percent of the power demand in the United States through clean, renewable, and zero-emission energy sources.” It ties the fight to stop climate change to the broader effort to create a more equitable society. People who actually know what they are talking about, such as Vox climate writer David Roberts (who, while no radical, does the most useful climate reporting in the country) praised the resolution for having a level of ambition that matches the scale of the problem. Climate change is such a severe crisis that the “opening bid” of any agenda had to be nothing less than a full transformation of the Earth’s energy systems, and it’s good that the AOC GND recognizes that. There are perfectly fine critiques of the Green New Deal in its existing embryonic form. Any serious plan to address climate change has to have an international dimension, because while the U.S. is the 2nd-largest carbon polluter it is not responsible for the majority of emissions. The GND needs to be part of an effort to get other countries to bind themselves to climate commitments by showing that we take our own seriously. And it’s certainly true that there are going to need to be greater specifics and that the “paying for it” question can’t be dismissed by pointing out that we never ask the military how it’s going to pay for its latest piece of colossally expensive gadgetry. But a resolution is exactly that, a statement of resolve, and critics who are asking for a full policy apparatus are misunderstanding what this part of the process is intended to do, namely state the list of goals as we work on the arduous process of fleshing out workable solutions. I don’t think anyone should be particularly interested in hearing criticisms of the Green New Deal proposal unless they are constructive criticisms. There’s going to be a lot of crying “That will never pass” and picking out the most wildly transformative thing a GND proponent has suggested, then declaring it proves leftists have their heads in the clouds. As for “it will never pass,” that’s quite obviously silly. Things pass when you build political movements to make them pass, and they don’t when you don’t. I do not want to hear from those who have failed to predict previous drastic shifts in American politics about what “can” and “can’t” happen politically. These are often self-fulfilling prophecies: The boundaries of the politically possible are defined in part by beliefs (“if you will it, it is no dream”!) As for criticisms of the substance of environmentalist plans: We need to demand that those who have objections offer alternatives. The New Yorker‘s Osita Nwanevu said that “no one criticizing the Green New Deal—not a single person—has an alternative plan for transitioning the American energy economy in the timeframe climatologists say we must.” I certainly think he’s right that you hear very few substantive proposals. What’s Nancy Pelosi’s plan? Forming a committee to dither on the problem for a few years before proposing some package of pitiful half-measures? Every politician needs to be faced with those crucial questions: Do you accept the scientific consensus on climate change? If you do, what plan do you endorse? And if they don’t have an answer to #2, they need to be fought. For far too long, Democrats like Pelosi have talked as if they care about climate change, without actually demonstrating that they do. That needs to end, and it needs to be made clear to them that unless they sign on to a comprehensive plan immediately, every effort will be made to oust them from office and replace them. 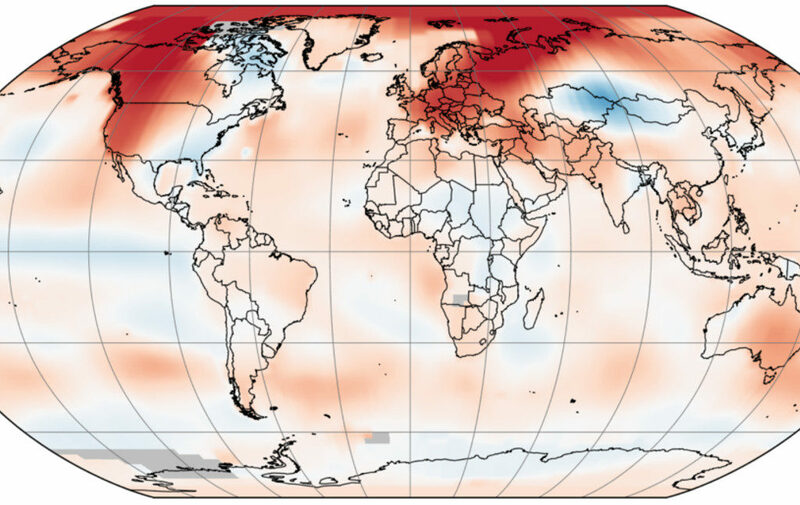 There is a “climate litmus test” in operation, and there are no exceptions to it. We have five times as much oil and coal and gas on the books as climate scientists think is safe to burn. We’d have to keep 80 percent of those reserves locked away underground to avoid that fate. Before we knew those numbers, our fate had been likely. Now, barring some massive intervention, it seems certain. Yes, this coal and gas and oil is still technically in the soil. But it’s already economically aboveground – it’s figured into share prices, companies are borrowing money against it, nations are basing their budgets on the presumed returns from their patrimony. It explains why the big fossil-fuel companies have fought so hard to prevent the regulation of carbon dioxide – those reserves are their primary asset, the holding that gives their companies their value. It’s why they’ve worked so hard these past years to figure out how to unlock the oil in Canada’s tar sands, or how to drill miles beneath the sea, or how to frack the Appalachians. If you told Exxon or Lukoil that, in order to avoid wrecking the climate, they couldn’t pump out their reserves, the value of their companies would plummet. John Fullerton, a former managing director at JP Morgan who now runs the Capital Institute, calculates that at today’s market value, those 2,795 gigatons of carbon emissions are worth about $27 trillion. Which is to say, if you paid attention to the scientists and kept 80 percent of it underground, you’d be writing off $20 trillion in assets. The numbers aren’t exact, of course, but that carbon bubble makes the housing bubble look small by comparison. It won’t necessarily burst—we might well burn all that carbon, in which case investors will do fine. But if we do, the planet will crater. You can have a healthy fossil-fuel balance sheet, or a relatively healthy planet—but now that we know the numbers, it looks like you can’t have both. Do the math: 2,795 is five times 565. That’s how the story ends. This is the choice we face, then: a comprehensive climate plan, or global temperatures that spiral further out of control with unthinkable consequences for life on earth. It should no longer be permissible for any Democrat not to have climate change at the very top of their agendas. It was barely mentioned in 2016. In 2020, we should talk about it constantly. It feels strange to exist at such a pivotal moment for the fate of the earth, but here we are, and those who want history to look favorably upon them need to make clear which side they’re on. 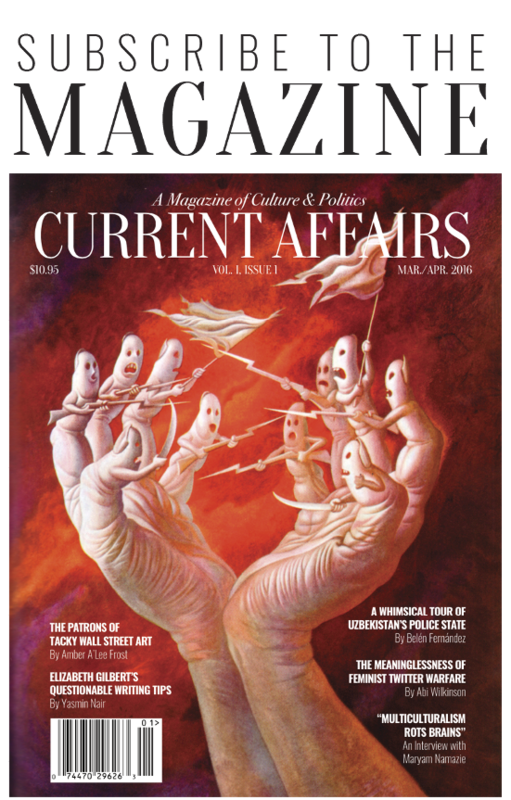 Current Affairs would like to expand and improve its climate coverage. We are entirely reader-funded and depend on your support in order to produce new work. Please consider subscribing or donating to help us continue to build a vibrant and effective independent media outlet.